Greek authorities are looking for dozens of people missing after the deadly wildfires near Athens. One father, who is desperately looking for his nine-year-old twin daughters, said he had seen them on TV being rescued by a fishing boat. Yiannis Philippopoulos has not heard from the girls, Sophia and Vasiliki or from their grandparents, who they were with on the day. "We went to the hospitals and police and then the fire brigade said the last resort would be to look for them in the mortuary," he told Greek media. After visiting the mortuary and providing DNA, Mr Philippopoulos and his wife saw a TV report, showing two girls who resembled their daughters being rescued. Images of the girls huddled on the boat were broadcast across Greek media on Wednesday in the hope of tracing them. However, later reports said the girls were believed to be the daughters of another man, who was onboard with his wife. The man went to the police on Wednesday after the image circulated. There is no formal count of the missing. The fire brigade has received dozens of calls, but has been unable to verify the exact number. Relatives of those reported missing have posted photographs of more than 30 people online in the hope of tracing their whereabouts. Coastal patrol boats combed the shoreline on Wednesday, searching for survivors and bodies, while rescue teams searched houses and cars. High winds of up to 100km/h (60mph) spread the fire on Monday, trapping many in homes and vehicles and forcing others into the water as they tried to escape the flames. On Tuesday, the bodies of 26 adults and children who apparently died embracing each other were found on a cliff top. 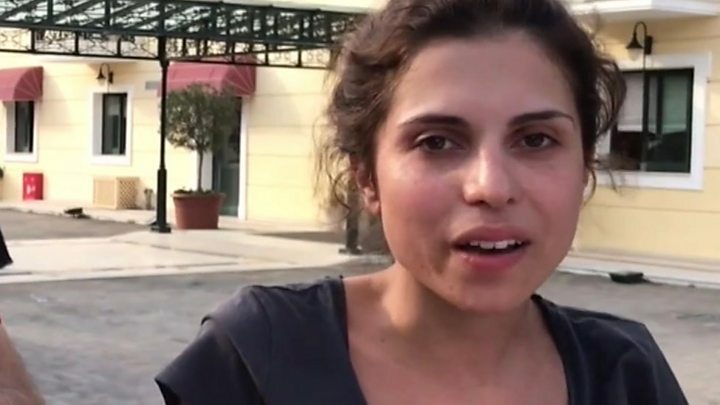 Media captionKaterina Pantelidis: "I jumped from the flames"
"They had tried to find an escape route but unfortunately these people and their kids didn't make it in time. Instinctively, seeing the end nearing, they embraced, " Nikos Economopoulos, head of Greece's Red Cross, said. The mayor of Rafina, Evangelos Bournous, told the BBC that the dead could exceed 100. Fire brigade officials say that some of the missing may have died. Bodies lay just 15m (50ft) from the sea, photographer Pantelis Saitas said. Among those killed as the fires swept Eastern Attica were a Belgian tourist, and a Polish woman and her son. A British man and woman were treated in hospital for their burns. More than 70 people were still being treated in hospital on Wednesday, and 10 were in a serious condition, Greek reports said. Others have been evacuated to temporary accommodation. Prime Minister Alexis Tsipras has declared three days of mourning, and a state of emergency in Attica, saying all emergency services have been mobilised. Italy, Germany, Poland and France have all sent help in the form of planes, vehicles and firefighters, while Spain, Turkey, and Cyprus have also offered assistance. The government in Athens as well as emergency services have faced claims that their response to Monday's emergency was too slow. 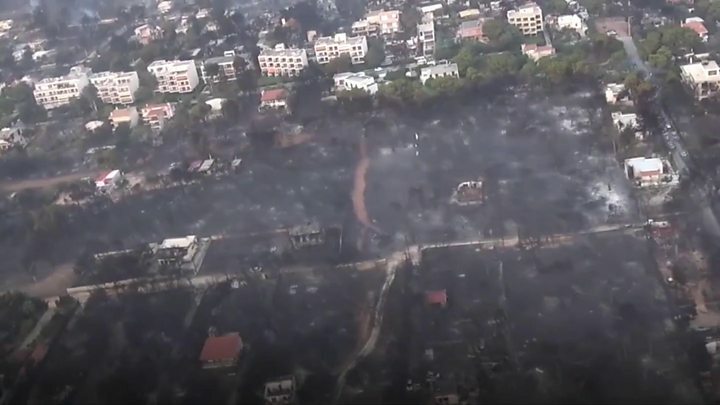 A Supreme Court prosecutor has ordered a probe into the cause of the fire, amid allegations that there was no evacuation plan in place. The seaside resort of Mati is popular with foreign tourists and locals, especially pensioners and children attending holiday camps. Greek reports suggested that 1,500 homes had been damaged and many had been destroyed. "Fifteen fires were started simultaneously on three different fronts in Athens," said government spokesman Dimitris Tzanakopoulos. Greece, he added, had requested drones from the US to "detect any suspicious activity". Greece's last major fire disaster was in 2007, when 77 people were killed in the southern Peloponnese peninsula. Wildfires are a major concern across Europe this summer. Sweden has also battled fires the length of the country, while Latvian authorities suspect arson was behind a major peat and forest fire in Valdgale County that burned for days. The serious nature of such fires and their wide geographical spread has led to speculation that climate change may be the cause. While no individual weather event can be linked to climate change, a general correlation does exist between warmer global temperatures and the dry conditions that can spark several dangerous fires at once. Are you in Athens? How have you been affected by the wildfires? Email haveyoursay@bbc.co.uk.